Topics: What We Do, and Contactus. Comcast Business Communications Llc New Jersey is the location of the Microsoft-IIS/5 server. 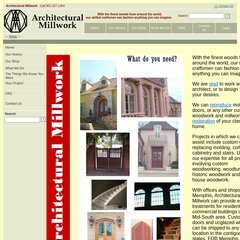 A-millwork.com's server IP number is 75.149.126.101. It has 5 nameservers, including dns2.name-services.com, dns3.name-services.com, and dns4.name-services.com. PING www. (75.149.126.101) 56(84) bytes of data. A ping to the server is timed at 38.1 ms.